rebecca likes nails: stamping FAQ has been updated! Hi everyone! I kinda took a week off from my blog last week... Not sure why but I just did. Perhaps it will motivate me to post more this week! I realized that my Stamping FAQ post needed some serious updating so I've just done that and then updated my other pages as well. And then I reverted back to my old blog template because I missed it! As well, I added a link to my Instagram because I love that shiz. 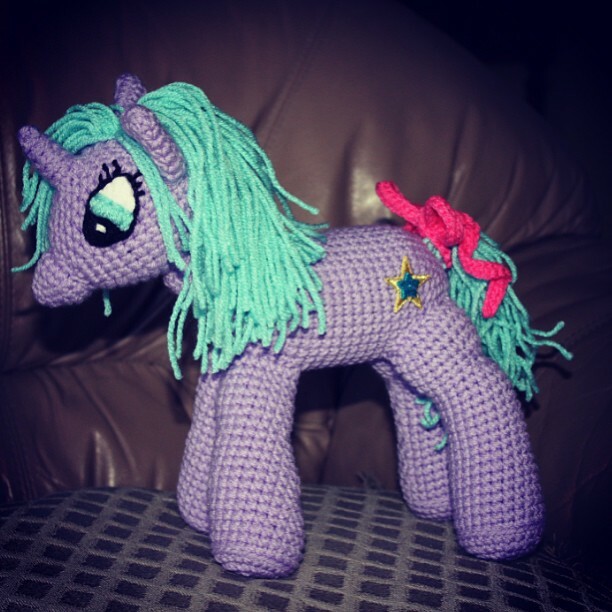 I crocheted this My Little Pony!! Princess Sparkle. Isn't she adorable? I made her for my friend Staci and it was really hard to give her away... Perhaps I should make my own! Now... to write some nail posts. Have a great day! That pony is so crazy cute. Love it! Was it hard to do? I do some crochet, but have never tried anything like that! it definitely requires some experience, but i didn't find it too hard! Thanks so much for sharing the pattern, I'll go check it out! Excelent gift, you are so talented! That is ridiculously cute. I'm just learning to knit - I love all the craftiness that's going around at the moment!